In addition to outsourcing production capacity, and focus on knowledge production, it is also possible outsource the latter. The text below is an attempt at writing a short essay about the connection between conceptual art and our knowledge economy. 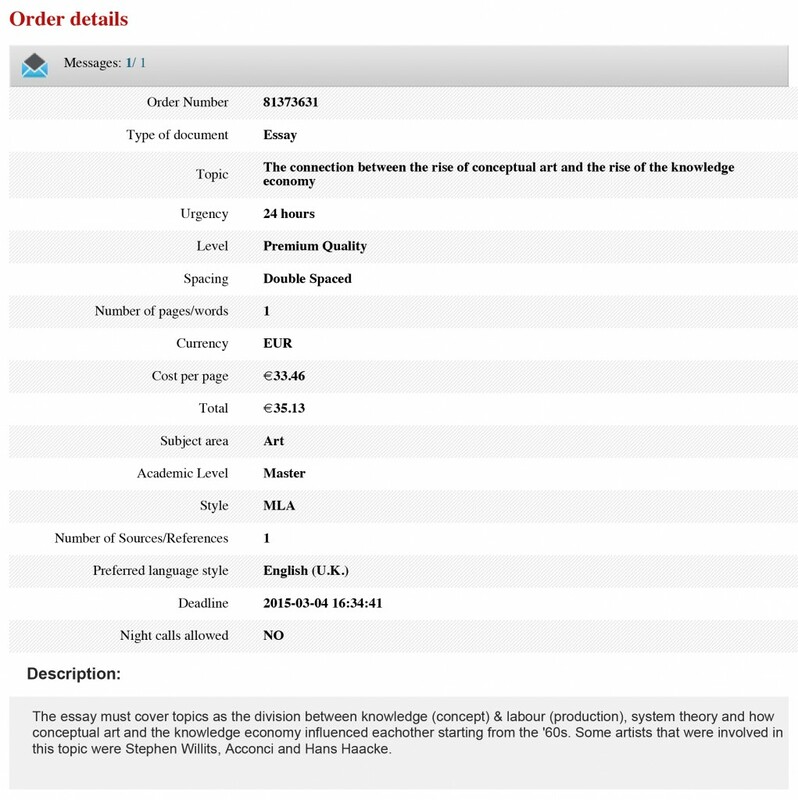 The essay has been ordered at college-paper.org for the amount of € 35.13 and was based on the following request: "The essay must cover topics as the division between knowledge (concept) & labour (production), system theory and how conceptual art and the knowledge economy influenced eachother starting from the '60s. Some artists that were involved in this topic were Stephen Willits, Acconci and Hans Haacke". Conceptual art is about meanings and thoughts but not about resources. It is distinct by the way in which it questions art. Particularly, conceptual art challenges the conventional class of art objects being commercial, collectable and only one of its kinds. Art assumes different forms such as charts, photographs, videos, language and maps. The thinking of most artists has been determined by conceptual art. A society whose use, distribution, manipulation, integration and creation of information are an activity that is important in an economic, cultural and political way is called an information society. Systems theory is a method in industrial relations that likens the endeavor to a living being with mutually dependent parts, where each has a definite purpose and responsibilities that are interconnected. Information society seeks to acquire viable benefit globally by using information technology in an industrious and artistic way. Its equivalent is the knowledge economy where wealth is created through exploitation of understanding economically. The multifaceted and vague relations between the modern art markets and conceptual art are a current issue in conceptual art. According to Wilson, conceptual art has attempted to oppose the logic art market has commercially through dematerialization of the art object. Due to knowledge economy, work that was supposed to be politically, socially and culturally advancing in the years of 1960 has been taken over by a new capitalism form as an instrumental thinking that is economic. This form of capitalism has the intention of totally exploiting the social and innovative being. In the middle of 1960s, the art market was infused with corporate funds, which led to its expansion. Many in the corporate world believed that art that was fresh and ground-breaking represented new levels of entrepreneurship. In conclusion, conceptual art has advanced massively with the introduction of knowledge economy. It has introduced new criteria of judging art where people find themselves asking if a piece of art is interesting rather than if it is moving or beautiful. Wilson, Mick. "What is Conceptual Art?" Irish Museum of Modern Art (IMMA) (2011): 1. Article.